Please follow our adventures at our new web address. www.mylittlepandesal.com and because you are going to click on that link to see our new blog. I’m going to get you excited because there’s a new post over there with photos. If you signed up to get email updates through this blog, please make sure you sign up on the new one because this blog will not be updated anymore. Thanks for understanding everyone! We love you all! I realize, the only time I’d ever find time to write is in the morning. When all is quiet and Desmond is still asleep. I’ve decided that this will be my me time. My creative time. Taking care of Des is so much work that even finding a time to nap is quite hard. That’s why I have to consciously make the effort to work on me. That way I can take better care of him and even Nick. I have been talking to friends about how I am feeling a little restless. Don’t get me wrong, I LOVE BEING A MAMA! But there are times when I find myself wanting to do something creative. Something that involves art. Something that is me apart from family. I think we all need this in life. To have something for ourselves to makes us feel alive. A little like when I was doing capoeira. I didn’t want Nick to do it with me, I wanted to do it myself. To make friends apart from my husband’s friends. To be good at something that he doesn’t have to be good at. It made me feel alive every time I got out of the training sessions. I knew I could something that was my own, with my own strength and effort. Now that I’m a mama with a little one who depends on me. I can’t just go out and take classes just like that. I have a schedule to follow. A small time frame for myself before my little one needs me. For now with Nick being home, it’s been easier to just go, walk to the junction, have myself a cup of coffee and find inspiration on my walks. But once Nick goes back to work, it will be a little tricky. That’s why it seems like mornings are the way to go. Even if I am not a morning person. A lot of you people know that about me. But if I want to get things done and get myself inspired, I need to work on my morning me time. So recently, I bought myself a sketch book and a pencil. I’m not much of a sketch artist but I am a doodler. I remember my days of doodling during history class in college. I drew a lot of cows. But I still did very good in class mind you. My brain remembers better if there are images attached to what I’m trying to learn. It is after all a memory technique. I will try and draw. Draw draw. Work on my creativity and discipline. I am not dropping photography of course but I think that doing other types of artwork would help inspire me with my photography. I need it. We all need it. To be inspired and encouraged. That we can do what we want to do. We just have to put our energies into it. Before I started this post, I was going to write about Desmond’s first trip to the island. I guess it will have to wait. I just felt like I had to write my mama thoughts down. I am going to leave you all with a photo of where my creative energies go. 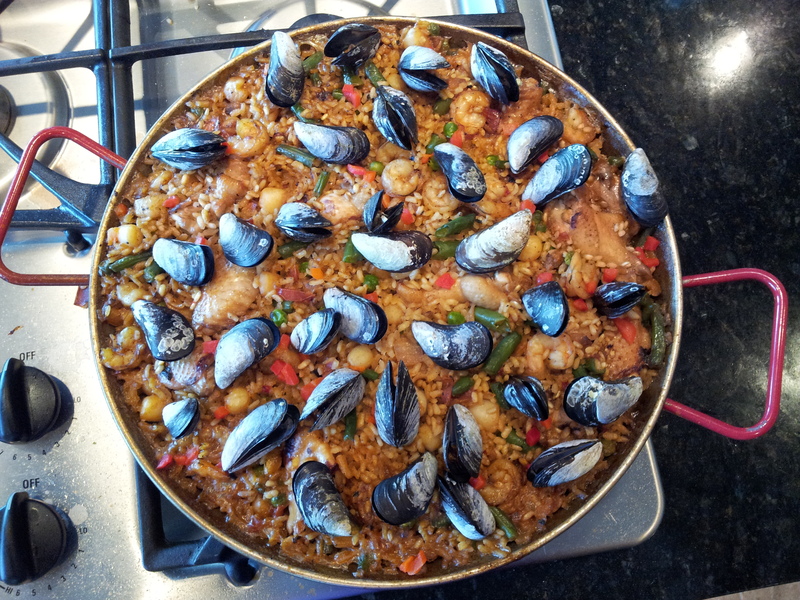 A photo of paella that I made last weekend. Cooking is creative. It is a lot of work sometimes, but it makes me feel alive. Every sense in my body is touched by cooking. To smell the aroma, to hear it sizzle on the pot, to see all the different shapes and colors come together, to feel the texture on my tongue and to taste the most amazing food I could ever make. It is an awakening of the senses. My favorite part after cooking is not just getting to eat what I made, but I get to take a photo of the artwork that I just made. With that, I will take it on another level and work on my food photography skills as well. I pray for passion, creativity and inspiration. I pray that my little Desmond would also find his creative outlet and be passionate about it. To pursue his dreams without looking back. Des is going to be a creative man when he grows up. I know it.